Greece is the latest corner of our planet to be stricken by wildfires. Powerful winds whipped up flames on Monday, killing at least 60 people as of Tuesday. A number of factors came together to spark the devastation, many tied to how humans are changing the climate and how we choose to live. Ignoring that context means ignoring a big part of the story and the overwhelming challenges we face as the climate continues to trend hotter and drier. The countryside around Matis, a popular vacation destination northeast of Athens, has been turned into a postcard from the apocalypse. Whitewashed homes have become burned-out husks, and vacationers and residents have fled to beaches to avoid the flames. But in some cases, escape was impossible, with the bodies of 26 adults and children found huddled together at the edge of the sea, according to the BBC. Noxious plumes of smoke have spread over Athens and and across the Mediterranean, raising air quality concerns. And Greek firefighting resources are spread thin, with authorities requesting help from abroad. “Greece is going through an unspeakable tragedy,” Greek Prime Minister Alexis Tsipras said in a televised address. Reports indicate that humans may have sparked the fires in what’s becoming an all-too-common story. But we’re also likely responsible for the background conditions making fires more common. This part of Greece is on track for its warmest year on record, according to data kept by the US National Centers for Environmental Information. It’s not a one-off data point, either. Temperatures have been rising there since record-keeping began, just as they have around the globe due to carbon pollution. It’s not only getting hotter—it’s getting drier as well. “Generally speaking, there has been a long-term drying trend over the greater Mediterranean, and Greece has been a hotspot,” Colin Kelley, a climate researcher at the International Research Institute for Climate and Society, told Earther. Numerous studies have shown that the area has seen a steady increase in summer drought conditions due to both human and natural causes, and it’s a trend likely to continue as the climate warms. 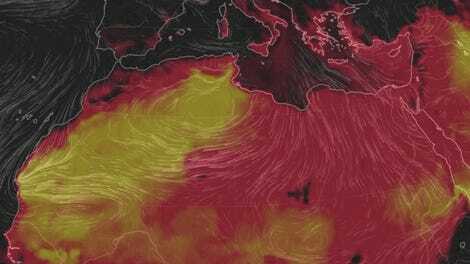 Kelley said the Mediterranean is also a “hotspot” globally for future drying. 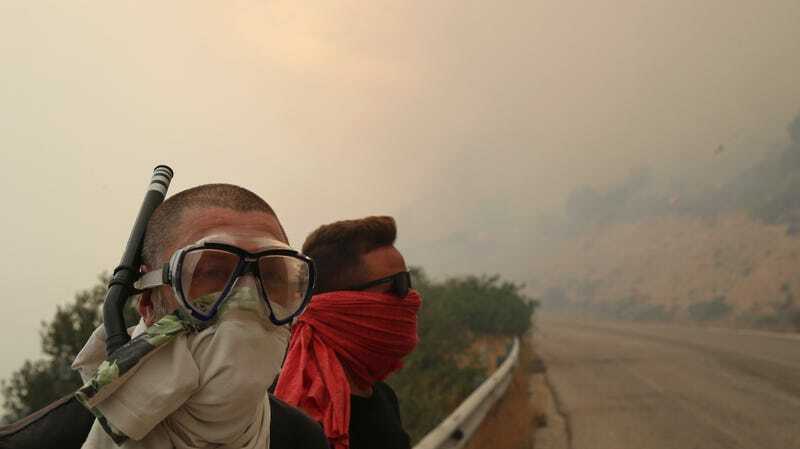 When we talk about the Greek fires, it’s not that they’re were caused by climate change. They’re happening in a changed climate, one that affords them the unfortunate opportunity to flare up and rage out of control. Just as it’s impossible to talk about fires without talking about climate change, it’s also impossible to talk about them without discussing about where we choose to build. Humans have increasingly moved to places of great danger. Panos Giannopoulos, a Greek weather forecaster, told Earther the location of the fires was a place of “exceptional beauty” that has changed dramatically over the past few decades. Greece is hardly the only place where this has happened. California is perhaps the most prime example in the U.S. of a place where more people are moving to fire-prone areas, but it’s a trend playing out in other places in the U.S. and around the world. According to a 2015 report, 60 percent of all new housing units in the U.S. built since 1990 were sited in what researchers call the wildland fire-urban interface. In other parts of the world with a Mediterranean-like climate, it’s a similar story. So basically, we’re increasingly moving into areas where wildfires burn, our infrastructure is causing more of them, and climate change is creating conditions for them to spread further and faster. Oh, and firefighting resources and budgets are being stretched thinner than ever. Something has to give. In the meantime, Greece will mourn and also stay alert. Giannopoulos said unsettled weather is likely over the next week, with afternoon thunderstorms that could bring gusty winds and again fan the flames.